Most of you will want to own the latest creations and the newest innovations from the world of fashion. If you are one of them, you will have to spend some time looking at the Saint Laurent Medium Bellechasse Bag in Black Leather and Suede. The bag is different than any other model you may have ever own. Why? Well, it is made to be different. The first thing we noticed and also the first one you will notice is the presence of two colors. Yes, both of them are black, but the upper part of the bag is brighter, while the lower one is darker. This creates an impressive effect and it makes the entire bag more specific, versatile and different than any other bag has to offer. At this point we will have to add that the Saint Laurent Medium Bellechasse Bag in Black Leather and Suede is the latest creation of the company and it has been made to be worshipped. Inside you get space, obviously. In this scenario, the space is sufficient for a smartphone, a wallet and also for makeup. We liked the fact there are two compartments inside and one zipped for smaller items. In addition, there are slots for credit cards. In essence, the space inside is sufficient for most women. The shoulder strap is removable, but it is also practical and made out of leather, so it looks nice. The strap drop is 54 cm, so it is perfectly sufficient for most women. All we can say at this moment is that this bag offers all the practicality, paired with style and comfort you can possibly expect. 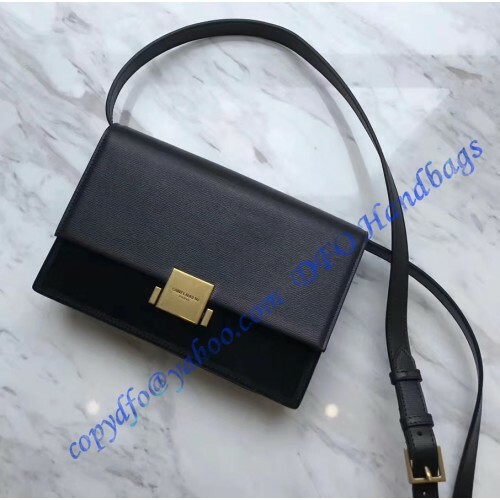 In addition, the bag is elegant, so you will have to use it on social events as well. Yes, you can use it every day as well, but this bag is specifically designed for those who want a perfect combination of practicality and style. At the end, we will have to add that the bronze colored trims are added as well. They look great and they make this bag just right. After all, it has been developed by professionals for those who want the best and the most appealing bag ever. If you are one of them, there is no need to look any further.